"Singer" became her prefix even before she rendered her first song for films. Making foray into the hearts of Andhra Pradesh audience through music talent search programs, this door-next girl captivated the hearts of Telugu film music lovers across the world with her mellifluous and talented singing. Awards and chartbusters followed and she became the most sought after singer of her generation. At the peak of her career, she married and left to the USA but her passion of "singing" is bringing her back to India regularly. 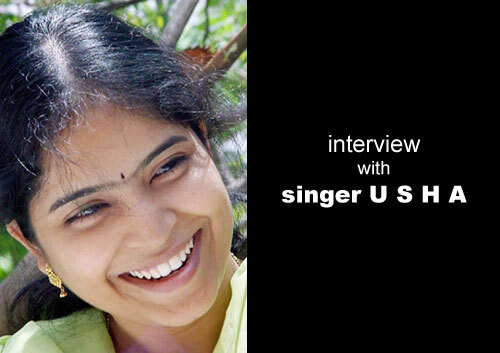 She is none other than "Singer Usha". How did your India trip go? Great! I was invited to judge Zee Telugu's saregamapa and the program is going great guns with very high TRP ratings. I also sang for couple of movies in the trip. Since you are an NRI, what do you think of the current trend of many NRI hopefuls from USA venturing into Telugu films? It is a very good development. It is great to see lots of NRIs showing interest in the Entertainment industry. Entry of new talent always makes the Telugu film industry more exciting and happening place. But to succeed in films, we need to have perseverance, hard working nature and creative talent. Once we are aware of these prerequisites, everything should be fine. At the time of your marriage, you were one of the top singers in Telugu films with numerous awards and chartbusters to your credit. Considering the current influx into the Telugu film industry from the US, don't you think you traversed in a reverse direction? (prompts for a while) for a bit I did. But soon upon my arrival to the USA, I found myself busy performing in musical concerts across the country. I was the lead female singer for Mani Sarma gari musical concerts in 2006 & 2007 and also hosted a program called Padamata Ushodayam. My downtime gave me the opportunity to develop more insight about myself as an individual. Living in America gave me a broader outlook towards life. But don't you think your career suffered because of your shift to USA? Movies: I sang around 40 film songs for leading music directors like MM Keeravani garu, Mani Sarma garu, Koti garu, Vandemataram Srinivas garu and many other upcoming composers. The movies I sang for include - Pandurangadu, Athidi, Chiruta, Gunde Jhallumandi, Pourudu, Ontari, Bhayya, Bhadradri, Mr. Gireesam, Chintakaklaya Ravi (bit song) and many others. TV programs: I anchored a music based program on Zee Telugu called "Swaraneerajanam". In summer of 2008, the same channel offered me to be a judge on "Zee Saregamapa" (being telecast presently). The only downside is it's not possible to sing for movies while living here; at-least for reputed music directors who like to approve their song sitting at the console. Recently there were news making rounds that you had quit singing? (laughs out loud) Oh really! I am amused at the news. I will never give up playback singing since it gave me a unique recognition among Telugu audience. In general, don't you agree that longevity for a singer has diminished in the recent times. Definitely. Also, the entry of many new singers has made the singing field a very competitive place. Does the increased competition worry you? Not at all. It is always good to have competition for it brings out the best in you. On another note, lots of singers are emerging from music competitions. But only a handful of them are becoming playback singers. What do you think is the reason? There is a lot of difference between singing in music competitions, stage programs and recording for movie songs. To be a successful professional playback singer one needs to have a commercial voice - I mean when you see a hero/heroine performing for a song on screen, you should hear the hero/heroine and NOT the singer. Voice quality, voice culture, ability to learn quickly and rendition with feel and emotion are other factors that enable an individual's success as a playback singer. SP Balu garu opined that you are the best female playback singer among your contemporaries <video link>. What was your reaction? Emi reaction untundi? Prapanchapu anchula daaka vellipoyenu (laughs). I was invited as a judge for semi-final episode of Padalani Undi on Maa TV when he mentioned those kind words. It is a well known fact that SP Balu encouraged me from Padutha Teeyaga days. He is like a father figure and I shall be indebted to him for my entire life for his guidance and blessings. In male singers I like - Ghantasala garu, SP Balu garu, KJ Yesudas garu, Shankar Mahadevan, Hariharan, Shaan, KK and Tippu. Among female singers I like - Suseela garu, Janaki garu, Chitra garu and Kalpana. Jagratta ekkuva (laughs). If you insist - I am a die-hard fan of Ilayaraja garu and AR Rahman. As a matter of fact, I enjoy good music irrespective of who the composer is. I like fast numbers with a western tinge. But you are branded as a melody singer in Andhra Pradesh? True, I got branded as a melody singer during my career and never got a chance to experiment with other genres of songs. The problem is once you achieve success singing a certain genre; everyone limits you to that genre no matter how hard you try to break free. During Mani Sarma's concerts in the USA, I was given complete freedom to experiment with different genres of songs like "Dole Dole" from Pokiri, "Taaye Yashoda" from Morning Raaga and various other mass numbers. He even encouraged me to experiment singing Dole Dole song in a pure classical style. I look forward to such versatile opportunities in the future. Chiranjeevi garu, Mahesh Babu and Jr. NTR. Actually I was never a big movie fan before marriage. I used to watch movies on a selective basis. After marriage, because of my movie fanatic husband I end up watching each and every movie (giggles). Any recent movies that you liked. I liked Astha Chemma, Gamyam, and Jab We Met. Your proudest/happiest moment(s) to date? During World Telugu Federation conference at Singapore in 2002, I had the honor of sitting next to Chiranjeevi garu and talking to him at length. He mentioned that he had watched one of my interviews on Maa TV called "Goranta Deepam" and recounted every word I had spoken (in that interview). He conveyed that he and Surekha garu admired my singing. Singing with SP Balu garu in the Afro Asian games ceremony was another high moment for me. On a personal note, the birth of my son Agastya (18th May 2007) is the happiest moment in my life (so far). If god gave you a chance to make one amend in your singing life, what would you do? To take birth few years earlier so that my singing career coincided with THE Ilayaraja era. I recorded 2 songs for him in 2003. The Telugu movie market has grown exponentially in the US in recent years. What are your thoughts? I think this is just the beginning and we are bound to see bigger things happening in the USA for Telugu movies, music and television. The willingness to explore media opportunities has grown tremendously especially among NRI population in the USA. What about music scene in the USA? With the advent of professional singers and music concerts by the likes of Mani Sarma and Devi Sri Prasad in the USA, the quality and standards have risen to dizzy heights. I foresee music programs like Saregamapa and Antakshari in the USA as well. Any advice to young singers out there? Don’t try to imitate anyone. Now a day, it becomes difficult to know the singer when you hear a song. We need to look at the inlay card to find out who really sang the song. I feel bad that at times good singers too try to imitate and lose their identity. I will continue to visit India regularly and sing in movies and participate in TV programs. We do have plans to return to India for good and that will be within the next few years. How can your fans and admirers contact you?